Play These Before You Die! There’s a book called “1001 Video Games You Must Play Before You Die“, and it sounds like EarthBound and MOTHER 3 are included. EarthBound remains one of those titles that is name-checked by the video gaming cognoscenti more often than it’s actually been played, and that’s a crying shame, as the game behind the reputation is utterly brilliant. A quirky, comical RPG set in the real world rather than a mythical yesteryear filled with dragons and fairies, EarthBound is vivid, colorful and consistently surprising, filled with memorable enemies and beautiful Americana-influenced backdrops, and centered on a brave band of backyard heroes setting off on the most unlikely of quests. In Japan, the Mother series of games–of which EarthBound is the second installment–is a massive RPG franchise, up there with the likes of Final Fantasy and Dragon Quest. In the West, however, the titles have had a harder time making their mark. The first game was translated but never released–it lives on as a full-time Internet rumor, going by the name of EarthBound Zero–and the third, and most recent, game is available in a very gray sense via loving fan translation. Only EarthBound itself made it across intact, which is still something to be thankful for, as the series’ oddball foibles (in the original Mother, the first enemy character to bring the player under attack takes the form of a humble table lamp) hardly make for bestseller material. Which is strange, really, as the overworld is charming and interesting, the characters are utterly adorable, and the battle system is so refined that you have the option of dropping out entirely and letting the game handle all conflicts automatically. Regardless of its lack of success on Western shores, EarthBound continues to exist in some corner of the gaming landscape where it’s always midnight in the suburbs, where aliens lurk in the darkness and adventure awaits around every bend. You can get a copy of the book here if you’re interested in reading more! Thanks to Digsu for the info! 28 Comments to Play These Before You Die! How charming that the writer thinks that the MOTHER series is even vaguely mainstream in Japan! It’s kind of sweet, really. I also noticed the thing where it said the patch got 100000 downloads, but that was only for the first short period of time (couple days? week? I can’t remember), I’m sure it’s actually well, well over that by now. It kinda IS. Not only is it very mainstream, but it’s a huge stale of Japanese gaming to this day. I don’t know where you got this bizarre idea that it somehow wasn’t, but you should probably know that you are, in fact, very incorrect with your assessment. sorry, I meant “stable” not “stale”. That was a typo. Don’t you mean “staple” ? It’s not a horse. I don’t know if it matters much, but even Itoi himself calls the series a “cult” series, as in not being mainstream. Whether he’s right or not is another thing altogether, but it does seem to be one of those things mostly people in their late 20s and up really know about and appreciate (at least in Japan). Given the reception of the various Mr. Saturn/MOTHER 2 arcade events a few years ago, I’d say that seems pretty accurate. Mother certainly is much more successful in Japan than it is in the U.S., but calling it a “massive RPG franchise, up there with the likes of Final Fantasy and Dragon Quest,” is a pretty big exaggeration. Mainstream or not, i’m glad to be one of the people that played and enjoyed the game I will never forget. I remember the first time I saw the huge box in stores and looked at the back I wanted it right away. Yeah my friends that pay smash brothers also dont know where ness or lucas are from even after I explained it to them lol. They thought animal crossing. I wonder what number Earthbound was in the book. @Mato How many times has the game been patched? If I recall, that book is sorted by year and platform, not in any sort of “these are the best” order. Seriously, you’re lucky that you have friends who understand that Ness and Lucas are from a game series and want to play it. I know what you mean, even if they are only two or three people, it’s nice to see them embrace such an under appreciated game. Especially if a person uses Ness as their main character. I might let them borrow my copy of Earthbound, but I just got it and frankly, I want to enjoy every second of it. ^ Reminds me of seeing someone play as Ness and Lucas on an online match of brawl i once played in. I remember that both of us played as Ness or Lucas, and had a taunt party, and the other two were duking it out. For what it’s worth, I got the impression that it’s a cult series in Japan by living in Japan and trying to find a single person who’d even heard of the series. Turns out, much like America, it’s mainly a staple of the rare die-hard fan rather than a thing people are aware of for reasons unrelated to Smash Bros. If anyone would like, I could always check in here one day if I ever meet someone familiar with any of the games. I certainly don’t mean this as a criticism of the games; rather, it’s more a matter of how even in Japan, they never really caught on with the public in the way America’s die-hard fans might have hoped for a series that richly deserved its day in the sun. Oh, and the writer made a mistake: EarthBound doesn’t have an overworld. The “overworld” (s)he’s referring to is actually one giant map that holds every area in the game. My friend bought a copy of this book and I was looking through it the other day. It’s the spanish version, and in the translation, it looks like they’re saying that there’s a rumour saying Mother 1’s official english name is Earthbound Zero. In english is more ambiguous, but still, what “rumour” is there about EB0? It’s original planned name was Earth Bound, and the hacking scene nickname it EB0 to avoid confusion. 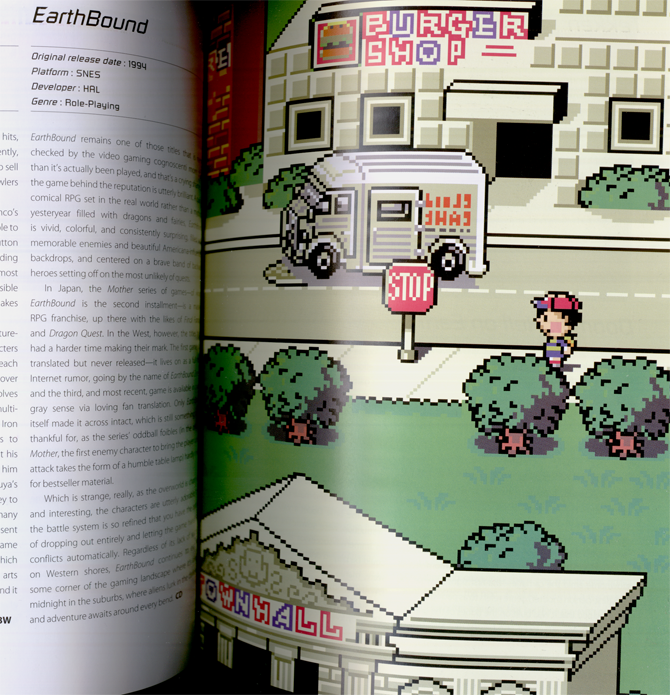 Anyway, aside from that, yeah, it was very cool to see these 2 games on the book, Mother 3 didn’t get any picture (but they do mention the fan translation :), but Earthbound got a full-page picture which was nice. Too bad Nintendo doesn’t want me to play any of those. “Mother 3 is perhaps known for the story surrounding the game and its creator than the game itself. Released only in Japan, it encountered a slew of develeopment problems and was originally slated to be released more than a decade earlier for the Super Nintendo console. A loose sequel to the previous two outings, Mother and Mother 2 (Earthbound), it follows a team of characters led by Lucas and Flint in their battles against the Pigmask Army. Much like Duke Nukem Forever, the game Mother 3 floated on in the ether, appearing in advertisements and discussed excitedly online. Part of the mystique is due in part to the game’s writer, Shigesato Itoi. Itoi has worn many hats during his lifetime, his work including voicing a role in Hayao Miyazaki’s My Neighbor Totoro and co-writing a collection of stories with Postmodern author Haruki Marakami. It was Itoi who gave Mother 3 its sometimes twisted narrative and flair. For example, one of the settings Tanehineri Islands, is in fact an evil mirror image of the home of the two main protagonists, Lucas and Flint. When Nintendo decided to keep the game as a Japan only release, a team of fans embarked on the process of translating it on their own. IT was no small task. Like most good role-playing games, Mother 3 is text heavy, featuring tens of thousands of lines of dialogue. After more than two years of work, a patch containing the final translation was released, a testement to the hard work of translators and their rabid appreciation of the series. Mother 3 was downloaded more than 100,000 times and, although such a number wouldn’t have made it a hit in commercial form, it did bring a great adventure to the attention of players worldwide. This is a delightful return to an old classic and well worth playing. A few days ago I was over at my friend’s house and I found this book lying around in his study. Now his view on Video Games is that if its less than 32 bit, he consideres it “gay”, and even “gayer” if I like it (just t piss me off). I fliped through the book and found the Earthbound page imediately. It was nice to turn around and go “Screw you!” as I showed him. I wouldn’t call this a “mistake.” That all of the game’s areas are stored in one big “map” is just a detail of how the game was programmed. It doesn’t change the fact that the game has distinct areas connecting its dungeons, caves, and other levels. I think it’s perfectly fair to describe this as an “overworld,” as the term is typically used in RPG. i read this entry in the book when i found it hiding in my bookstore and i was really happy about the response it got by the author. It has a lot of interesting material in it and i suggest reading about the other great games it covers. im just happy that someone else might experience the mother series thanks to this book!